We’d love your help. Let us know what’s wrong with this preview of Pettikin by Abby Smith. To get Pettikin home, Allie must enlist the help of a powerful, yet unconventional, Guardian and prove to him that she has wha Aunt May’s funeral was strange, but things get stranger when fourteen-year-old Allie Thomas encounters Pettikin Periwinkle, a gnome with a love of sweets and a penchant for screaming, who is stranded on Earth after the death of its only Gatekeeper. To ask other readers questions about Pettikin, please sign up. Finally a well-written fantasy without all the heavy, violent darkness that is flooding the minds of young (and old) adults these days! Pettikin offers wholesome, pure and timeless tales of courage, true love and personal evolution in a fresh and engaging way. Intriguing for adults, inspiring and empowering for teens. It’s a great book that makes me laugh or cry and this book did both. I couldn’t put it down and really hope there is at least a sequel, and better yet a series! Y.A. is not my favorite genre, that said, I really enjoyed this book. I want to encourage the author to continue writing. Disclaimer: I received this book free from the author as part of Goodreads Giveaways. This is my honest opinion. Pettikin is such a magically unique book. The characters like Mrs. Widget, Bob, and Professor Theopolus, are colorfully painted. Especially Pettikin the gnome. I came to love his quirky behaviors and compassionate heart. The worlds are crafted so beautifully that they felt real even though they were fantastical. I loved this book so much. The only reason I docked a star is because the Disclaimer: I received this book free from the author as part of Goodreads Giveaways. This is my honest opinion. A very enjoyable read. The beginning was a bit slow (and info-dumping), but the book picks up by chapter 13 and I wasn't able to put it down. The writing was fantastic and the characters had distinct personalities and were very likable (my favorites were Andie, Mrs. Widgit, and Bob). The setting descriptions were so vivid and well written.However, I found that the romance (though it wasn't too much) wasn't really necessary and didn't add much to the plot line. But I can tell that the aut 4 stars. A very enjoyable read. The beginning was a bit slow (and info-dumping), but the book picks up by chapter 13 and I wasn't able to put it down. The writing was fantastic and the characters had distinct personalities and were very likable (my favorites were Andie, Mrs. Widgit, and Bob). The setting descriptions were so vivid and well written.However, I found that the romance (though it wasn't too much) wasn't really necessary and didn't add much to the plot line. But I can tell that the author had put a lot of thought into this story. FABULOUS!!!! Even if you don't read YA books you want to read this story. It is as fun as reading the first Harry Potter books. The world created is enticing, drawing you in, keeping you engaged until the story is done. The potential for more stories are there -- can't wait to see what this author does next!!! Fun read. It's like Stargate meets gnomes. It's well written, I could tell the author made a huge effort to edit content to make it easy to read for her audiences - something you don't always see in small- and self-published reads. Good clean fun. Wonderful book - great fantasy! This is an adorable book. I loved Pettikin and the two girls. The llamas are llamas but they are a big part of the book. Well written and enjoyable. Now time to buy the next book. Abby Smith spins a wonderful story full of adventure. It includes gateways, guardians and an adorable little gnome. It took me longer to read than expected because of the small type. This was a thoroughly enjoyable book, suitable for adults and children alike. A well put together fantasy. Enjoyed storytelling skills. Charming characters I would like to read more about them. Scary parts just right . Keep writing Abby Smith. Absolutely loved this book. I'm so happy that I won it!! Pettikin is so adorable! I really hope there will be a sequel with him someday! I received this book free for a honest review. I usually like adult books, still this is a very enjoyable read. I loved this book it was so funny. Pettikin is such a cute gnome you love him right when they meet him. So get a box of cookies and get ready for a fun story. Great book for kids!! Great plot!! I enjoyed the creativity of this book! I feel like I really got to know Pettikin! This was a delightful, light-hearted, post Christmas read! This book is a charming mix of fantasy and reality. 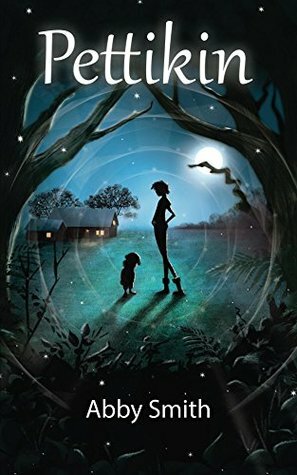 Abby Smith captures the voice of an American 14 year old girl beautifully while telling a story involving a captivating gnome, other worlds, and the bravery of a girl willing to explore them. Even if Abby were not a friend, I would still recommend it highly! I absolutely loved this book. I read it to my 2 kids, girl aged 11 and boy aged 8. I'm not sure who loved it the most. It's a fantasy book geared toward middle grade readers, but with universal themes that make it appealing to all ages. It's a hilarious book with tons of heart that manages to be instructive without ever being didactic. I highly recommend it.